Jejim is carpet concerning to the kind of pileless carpet. Jejim weaving is one of the archaic type used a woman labor. Jejims are woven with width of 30-35 cms, length of 15-20 meters of cotton yarn to narrow horizontal stripes on the machine. Different vertical stripes arraying jejims are unordinary effective, bright and decorative. In many cases weavers adorn the stripes with stylized images of household items (comb, cotton yarn, and candlestick) and geometrical elements. Depending on the color and quality of the thread of wool of jejim, they are smooth, one-colored and with flower illustration. Kilim is one of kinds of pileless carpets. Its both sides are used. The wide spread kind of pileless carpets is kilim. Kilim is characterized with crack-like light stripes surrounded by geometrical patterns. Patterns are in the forms of rhombus, triangle and trapezium according to the technology of kilim. 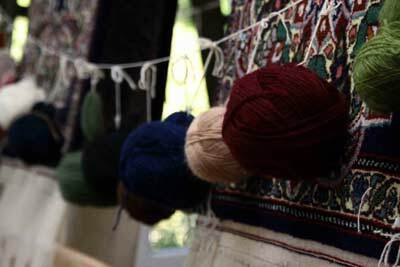 Composition of sewing in the different zone of the kilim differs according to patterns and color. For its technical features kilims can be divided into 5 basic groups. Gazakh kilims, Qarabagh kilims, Absheron kilims, Shirvan kilims and Tabriz kilims. Sadda is a carpet belonging to pileless kinds of carpet. In most cases saddas have chess like quadrangle patterns. The most spread pattern type on saddas or composition was the camel caravan illustration comprising rhythmic horizontal stripes. Zili is one of the interesting kinds of pileless examples of carpet. Zili carpets manufactured in Barda, Jabrail, Nakhchivan, Shirvan, Absheron, Khyzy, Tabriz, Gazakh and other regions were exported to Europe and Russia in XVIII century- early XIX century. For its composition and patterns zili carpets of Azerbaijan are very different. These carpets has typical dexterity of plastic of picture and emotional expressions. Typical feature of the ornament decoration is the description of the elements of big sign like big rhombus, pair horn and different styled element sorts.